Get the latest research, opportunities and news with the Marketing to Moms Newsletter. Millennial Moms are Here! More are coming! Boomer Moms. Generation X Moms. No previous generation of mothers has offered more opportunity to build brands and increase sales than Millennial Moms. Currently, this powerhouse generation of consumers represents $750 billion in annual spending and that number will continue to grow as younger Millennial women become mothers. Don’t be left behind using marketing tactics that worked for the Gen Xers and Boomers. Millennial Moms have their own distinct triggers and it’s imperative to speak their language in order to capture your share of their wallets. 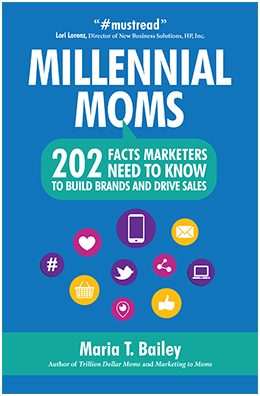 Millennial Moms: 202 Facts Marketers Need to Know to Build Brands and Drive Sales is the go-to guide for marketing to Millennial Moms. Ad Age credits Maria Bailey with creating the Marketing to Moms industry. 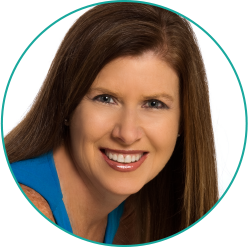 As CEO of BSM Media, Maria is the mastermind behind the most recognized and effective mom marketing programs. Disney Social Media Moms Celebration, HP Smart Moms Panel, Beaches Resorts Social Media on the Sand, Huggies MomInspired and National Mom’s Nite Out™ are among just a few of the widely known marketing initiatives she created for brands. Her insights and expertise also touched the redesign of Wal-Mart and Best Buy stores, the launch of Build-A-Bear Workshop Home products and the record breaking sales of Zhu Zhu Pets™. She is the author of 8 books, which are published in 12 languages and is an invited keynote speaker around the globe. Maria is seasoned marketer that doesn’t just spit out statistics and research but she executed on consumer behaviors to produce above average results. Maria Bailey has done it again. Today’s marketers will benefit greatly from Maria’s extensive knowledge and helpful suggestions on increasing relevance and engagement with Millennial Moms. Millennial Moms gives marketers just what’s needed to understand and tackle the next big consumer opportunity. Get this book, apply Maria Bailey’s 202 nuggets of wisdom, and then take your business to the next level. Maria Bailey knows and executes the art and science of connecting brands to Moms and Moms with brands for maximum benefit for all. Every consumer product I invest in gets connected to Maria to increase its speed to success.